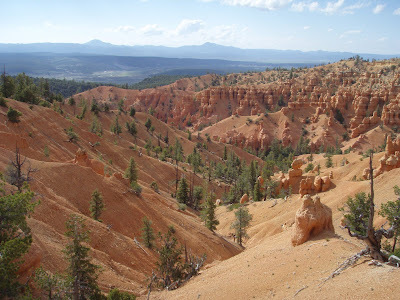 The Paunsaugunt Enduro is a self-supported endurance ride starting 6 AM Sunday, July 19, 2009 from Red Canyon Campground on Utah route 12 just E of Panguitch. There is no support or entry fee. It is a gathering of friends to ride rarely ridden killer trails and have some time for socializing in camp. You can ride it as fast or as slow as you wish. Some will wish to challenge themselves, while some will come to enjoy. Some may even do both. Rules are simple: leave no trace, be courteous to all trail users, take care of yourself, follow self-support ITT guidelines. Self-support means no pre-arranged support or caches, among other things. Understand that by riding this route with us that you are entirely responsible for your own safety, fueling, navigation etc. Teams of any number of riders may share equipment & supplies and will be listed with identical times. It's purely an honor system. Feel free to arrange support or caches, but times will be posted only for those following self-support guidelines. Report your times to me post-ride or here to be included in the results. 3 route options. We'll start/finish at the entrance to Red Canyon campground on hwy 12. The longest route (in red) circumnavigates the plateau. The 44 cuts off the southern half, and the 70 cuts off the southern traverse along the Grandview trail. Camping: Red Canyon campground has running water and showers (8 quarters gets ~ 8 minutes). It also fills up fairly quick on weekends. I'll get a couple of sites either Friday or Sat, look for the red Nissan pickup and come join us. I'll have a BBQ grill - feel free to use it. A note on the routes: the ~10 mile segment of the Grandview within the first 13 miles of each of the route options is very challenging and slow going. Soft ground, little used trail, and you will hike. A lot. 2-3 hours for the first 13 miles minimum. That is by far the hardest part of the 44 and 70 mile routes. If you are doing the 96 option bring bivvy gear and/or lights - I'm not entirely certain it can be done in a day. 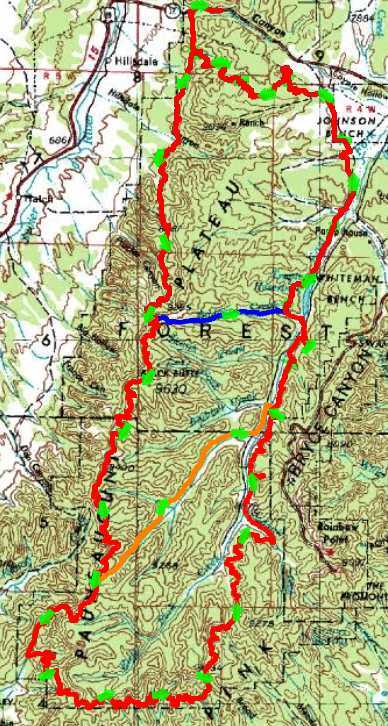 Water availability is good through most of the route. There is running water at King CG midway through the 44. 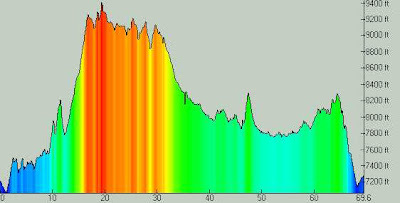 70 miler - over 10k' climbing. Lots of Grandview along the Sunset Cliffs. 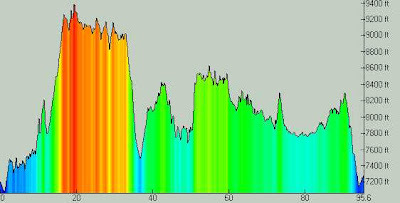 96 miler - ~16,000' climbing. 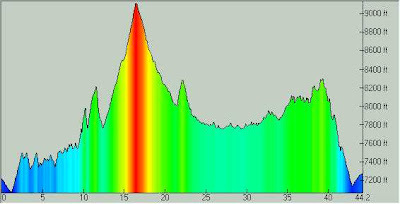 The additional 30 miles here doubles the route difficulty (at least), sound familiar DaveC? 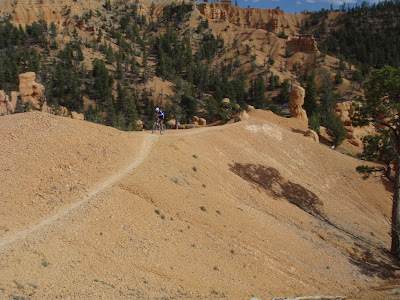 Same route as above with the addition of the Grandview along the southern end of the Paunsaugunt and more spectacular singletrack in the Crawford pass area just SW of Bryce NP. Little known, remote, committing - and surprisingly buff in places (not so much in others...). The full meal deal, this is an epic and will be a very long day and would also make a great 2 day route. Feel free to start on Sat the 18th if you'd prefer the 2 day option and want some post-ride socializing on Sunday. All routes hit Thunder Mountain. Crawford Pass trail, a rarely ridden gem. Are you in? Got questions? Just leave a comment at the bottom of http://2-epic.com/?p=799 so I know what to expect. I'll bring my BBQ grill again.